Looking for a reference book? During my prolonged bout with the virus I was reading everything I could get my hands on. As I was feeling better but still not good enough to be outside, I turned to all of my gardening reference books to keep me warm. 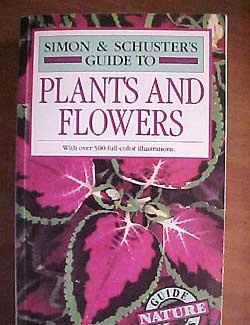 Here's one I totally forgot I had: Simon & Schuster's Guide to Plants and Flowers. What a great book. It's filled with gorgeous color photos of everything from camellias to pickerel weed and lots of stuff in between. I purchased this well before we moved to Florida at The Nature Company. And just for good measure I got it's companion Simon & Schuster's Guide to Cacti and Succulents. Check them out when you get a chance, and don't wait until you're sick to do it. Happy Gardening. Looking for a reference book? is one of the really interesting blogs I’ve found during my search for info about presents for gardening. Although Looking for a reference book? isn't exactly what I was looking for, I want to express my admiration, keep up the good work! While looking for more information about presents for gardening, I seldom see a good blog like yours.